Make a wrong forage harvest timing decision and it will cost you during the months ahead. Most producers are well aware of this mantra. However, a lesser-known fact is that the height of alfalfa is a key indicator of when to cut your forage crop, including pure grass stands. 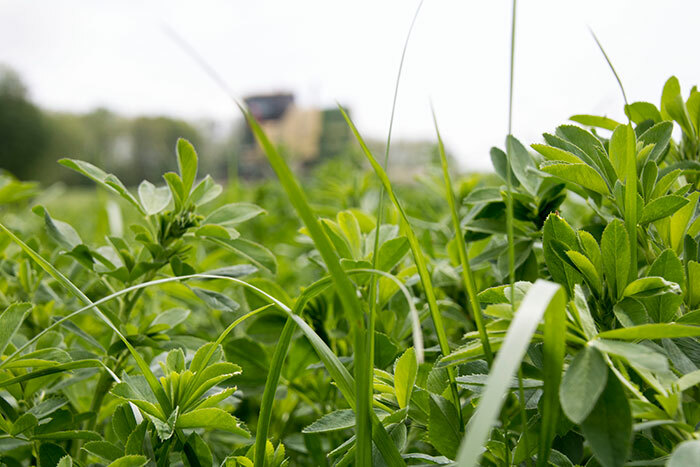 According to Rick Grant, president of The William H. Miner Agricultural Research Institute in Chazy, N.Y., Cornell research suggests to begin cutting pure grass stands when nearby alfalfa fields reach a height of 13 inches. If your alfalfa is mixed 50:50 with grass, cut when the alfalfa is about 23 inches tall. While grasses do contain more potentially digestible fiber than legumes, they need to be harvested at an earlier stage than alfalfa in order to realize their feeding advantage. Research has shown that for each day of harvest delay, neutral detergent fiber (NDF) digestibility for both grasses and legumes can decline by 0.5 to 1 percentage unit. This means that several days of delay can quickly turn milk cow feed into heifer feed. Essentially, productive dairy cattle can use grass forages efficiently as a source of fermentable NDF, but grasses need to be harvested earlier when they contain less lignin to optimize the rate and extent of NDF digestion. Higher NDF digestibility can give dry matter intake and milk production a hefty boost. Grant uses the example of a 1,400-pound cow that produces 90 pounds of milk per day while eating a diet that consists of a forage blend of 25 percent alfalfa and 75 percent grass. The alfalfa and grass contain 40 and 55 percent NDF, respectively. When the 48-hour NDF digestibility of the grass is at 60 percent, the cow can consume 52 pounds per day of a diet containing 54 percent forages to maintain production. But with an earlier harvest, the NDF digestibility of the grass rises to 76 percent, which then allows for a dietary percentage of the forage blend to rise to 64 percent while still maintaining high feed intake and production. What it all comes down to is this: The maturity of your forages at harvest has more of an impact on forage quality than any other factor, which in turn greatly influences production and profitability.